Plants are the foundation of habitats and ecosystems, but currently we do not have a good measure of changes in plant populations across the country. The National Plant Monitoring Scheme will sit alongside existing schemes for the UK’s birds and butterflies to help us understand more about how the countryside is changing. 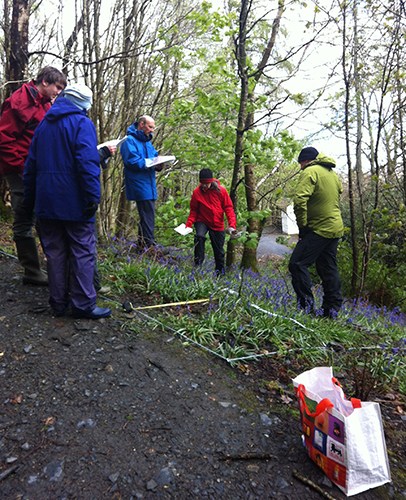 The National Plant Monitoring Scheme (NPMS) is a new habitat-based plant monitoring scheme designed by the Botanical Society of Britain and Ireland, the Centre for Ecology & Hydrology, Plantlife and the Joint Nature Conservation Committee. Expert volunteers carry out surveys of wildflowers and their habitats that will provide robust evidence of which widespread plants are increasing or declining, as well as indicating the changing state of our most valued habitats such as grassland, fenland, and even road verges. This is a scientific survey in which participants are randomly allocated a convenient 1km square to visit. The visit involves recording plant ‘indicator species’ in plots. Within a 1km square, participants will record around five plots in semi-natural habitats. Participants are asked to visit their plots twice a year, once in late spring or early summer and once in late summer. Surveying twice per year will help to get a clearer idea of any changes in vegetation, and will help to ensure that plants are not missed due to seasonal changes. In 2015, the first full year of the NPMS, over 430 locations across the British Isles were visited by volunteer surveyors. These surveyors surveyed over 1,700 plots, making almost 25,000 plant records. The ongoing collection of data such as these, coupled with the power of revisiting permanent small plots over many years, will give scientists detailed insights into changes occurring at the level of the plant community.